Bombers wrestling finished with the section tournament after many trials during their season. The bombers were down 36-31 against Mahtomedi going into the final match of the night. All of the team’s hope rested on the big man, Ryan Linde. Linde pinned his man which pulled the bombers ahead by one point and secured the win. The victory came from the entire team, including some of the earlier matches that were won by the younger wrestlers on the team. Since the last couple of seasons, the bombers overall record improved this year. The boys were able to pick up two wins in the section as well as a record of 3-6 in the conference. In the past, the team has mostly been run by the juniors and seniors. Due to some injuries that happened to the upperclassman, freshmen, sophomores, and even an eighth grader have found themselves wrestling at the varsity level. Though the season started out slow with the team losing five of their first six matches, the team was able to keep a positive attitude on the remainder of the season. The bombers then caught fire and won seven straight matches, including some tough opponents with Champlin Park and Pine Island. They finished with an overall record of 9-10. The team was ready for the second part of the season: the section wrestling tournament. At the sections, numerous bomber athletes competed and made a run for state. In past seasons, the Bombers have sent multiple wrestlers to state such as Cooper Peterson, Hayden Strain, Ryan Epps, and Clay Broze. Though nobody reached the state tournament this year, the team had a plentiful group of wrestlers place high in the section. Cooper Peterson, Preston Carlisle, and Erwin Strelow placed third while Ryan Linde, Chris Modrak, and Peter Fitterer battled their way fourth. Plainview-Elgin-Millville was able to defeat the bombers 44-33 which halted their trek to state. Despite the disappointing loss, there were plenty of achievements to be applauded on the season, especially from the younger athletes. Freshman phenoms Beau Zimmerman, Riley Keenan, and Preston Carlisle not only competed but succeeded at the varsity level. In his first year, Riley Keenan out-wrestled his opponents and finished with a season record of 19-14. 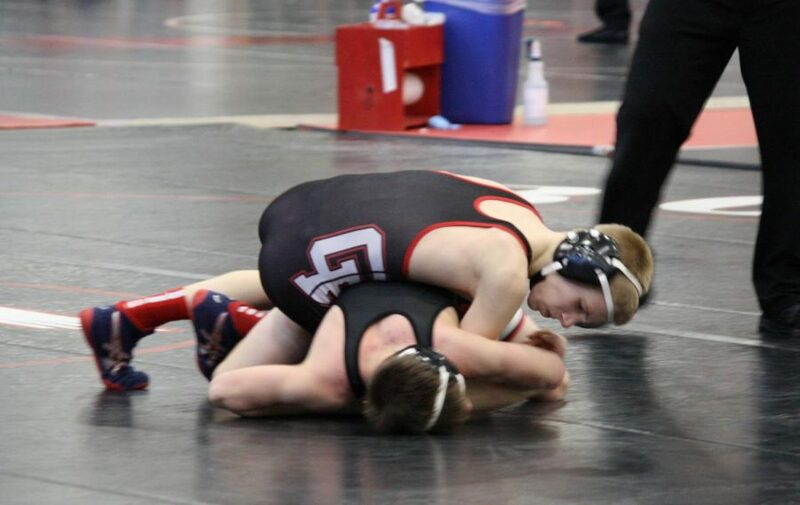 Zimmerman commented on how much he enjoyed the junior and senior classes: “The older boys make practices fun which makes the sport more enjoyable.” Sophomore Dillon Anderson decided to try wrestling for the first time this year. Anderson had a surprisingly exceptional year and finished 6th place in the section tournament. As the wrestling team will be losing a large group of seniors, there will be big roles open for the up-and-coming underclassmen. With the younger athletes already succeeding at the varsity level, the future of wrestling program looks bright for Cannon Falls.